This weekend, I drove for over ten hours and 500 miles to get back and forth from Denver to Aspen for Kelly’s wedding (some tunnel traffic on the return contributed to the long driving time). But despite the lengthy hours spent cooped up on my own solo road trip, I actually thoroughly enjoyed the drive. Not only was the scenery stunningly beautiful, but I also got to catch up on tons of podcasts and learn a lot while I was in the car. I have become rather infatuated with podcasts lately, listening to them on my drive to/from work in Dallas as well as walking around NYC. I subscribe to shows on a variety of topics – health and fitness (love the Jillian Michaels Show, Ben Greenfield Fitness, and Nutrition Diva), social psychology (Freakonomics Radio), entrepreneurship/careers (Suitcase Entrepreneur, Lifestyle Hacking Show), and productivity (The Art of Less Doing, Beyond the To Do List). Of course individual episodes can be hit or miss (just like blog posts), but the shows I’ve listed above consistently give me at least one thing to really think about per episode. To further maximize my time, I use my podcast app to listen to all of them at 1.5x speed (I use Pocket Casts – well worth the $2 price as the only app I’ve ever spent money to buy). I find that 1.5x is exactly the right speed to understand every word yet still prevent wasted time due to the natural pauses and slow speech that come when people are trying to be precise in sharing their words and ideas. It was a Beyond the To Do List ep from February that has really got me thinking this week though. 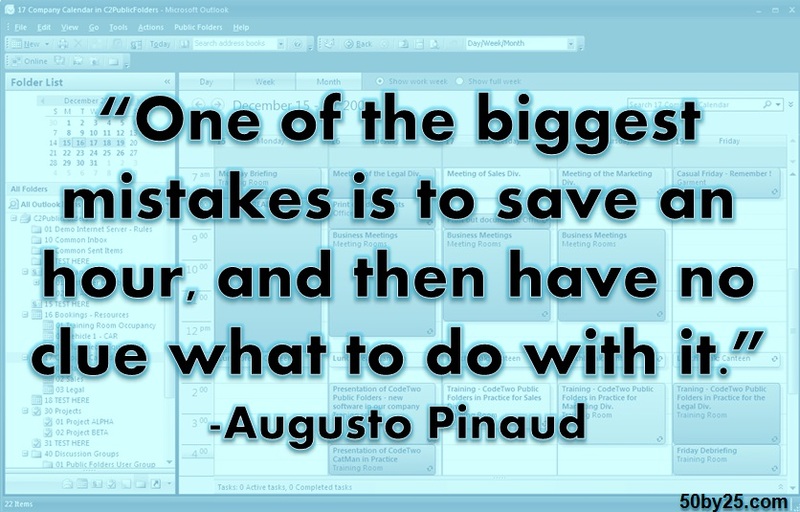 Augusto Pinaud, a bestselling author, was interviewed about his top productivity tips, and he emphasized the importance of not just saving time by being efficient, but by then using that time that you save in an equally efficient manner. How many times have you had a meeting canceled (woo, free hour!) but then wasted that time by surfing the web or chatting with coworkers instead of getting something done that you hadn’t originally thought you’d have time for? I am quite guilty sometimes of figuring out when in the day I’m going to get certain bits of work done, and then when additional time frees up, I don’t take advantage of it get something else done. For this reason, a lot of dream projects get left on the back burner. If I told you right now that I could magically make your day 25 hours long instead of 24, I can pretty much guarantee that your first thought wouldn’t be “Yippee, more time for Facebook/Twitter/timesuck of your choice” – and yet, that’s how many of us spend that extra time when we get it. I already try to maximize my downtime by doing things like catching up on my RSS feed via Feedly while waiting in line for lunch or on an elevator, which are only two minute windows of time, so why am I not taking the much more remedial step of using those big chunks of time that free up? We all have those “nice to get done” tasks, so maybe it’s time to prioritize them – or at least figure out what our dream projects are and what small tasks can be done in an extra ten minutes, thirty minutes, or hour. From now on, I’m charting a new course with my to do list. Instead of simply trying to get done everything that has to be done today (which I still think is a good way to separate my list and keep myself focused on the “must dos” instead of getting bogged down in minutiae that isn’t urgent), I’m going to set a goal for myself of also doing at least one “nice to do” task per day. 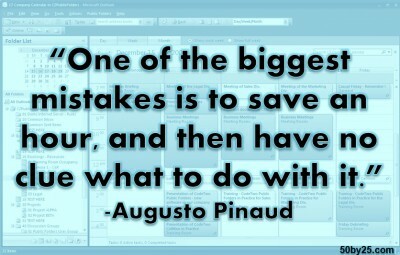 Furthermore, whatever task I choose must be something that furthers one of my seven big goals for 2013. It’s so easy to use 10 minutes to go for a walk around the building (which contributes to keeping my weight down), 30 minutes to write a quick blog post, or an hour to reallocate my financial investments. I keep a book with me at all times (which makes my “read 100 books a year” goal more attainable), but perhaps it’s time I started picking that up instead of idly browsing my smartphone when I’m waiting for something. And while it wasn’t one of my stated goals, I can always use that time to send a personal email/text/call to a friend to catch up and maintain stronger relationships – rather than just creepily browsing their social media profiles to see what they’re up to without actually connecting. What do you think? Are you as guilty as I am of this wasted free time? I NEED to get on the podcast train. This is so true, though. I found that once I started utilizing my commute time with audiobooks (I drive), I felt like I was getting so much more done because I was able to do something I enjoy. Although I prefer doing the physical reading, I get a similar satisfaction from listening, and I just don’t have the time to read as much as I would like. Now, I get at least two hours a day! Oh, and I’ve found that ebooks have helped my reading habit. With a book on my phone, I’m more likely to open that up than Twitter or FB to kill time. After all, I always have a phone with me! Anyway, such a good point. Always utilize the time you’re given! Something great to remember. I’m so, so guilty of this, and I’ve thought about it many times. It’s just so easy to use as a time waster when you’re bored, instead of heading out to actually DO something. Great mindset! I am going to try your idea too! Thanks Fit Girl! So much to say about this. 1. I think it’s hilariously over-achieving / uber-efficient of you to listen to your podcasts at 1.5x speed. Most people would not even know this is an option. 2. I frequently find myself mindlessly flicking through feedly during downtime instead of either (a) finishing off other work (b) creating content (c) actually connecting with people. It frustrates me no end that I waste time like this, and I know I need to stop. Apparently I am not the only one who does this – on Ben Greenfield podcast, he read someone’s review that said they listen to it at 1.5x too! It honestly comes out the perfect speed – you can still understand it. I know for a fact that I “waste” the free time that I get. I have been trying to use my “free time” to study more or get extra workouts in. But there are times when it just means a nap or a web searching. Totally guilty. 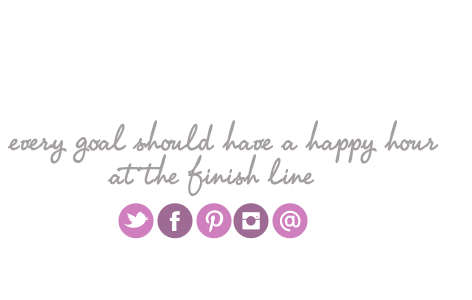 Laura @losingrace recently posted…Boston, Triathlon Training and Life in General. I love this. And I am so guilty of it. I’m saving this post for later so I can download some of those podcasts! I need to listen to more podcasts, I always get stuck on what to search for…too many options, ha! I generally have a book on tape in the car with me so that helps too and I feel like I can read 2 books at once (one real, one in the car). I have about a dozen podcasts that I listen to and it just auto-downloads the episodes, so I don’t think I’m in danger of running out of material anytime, luckily!